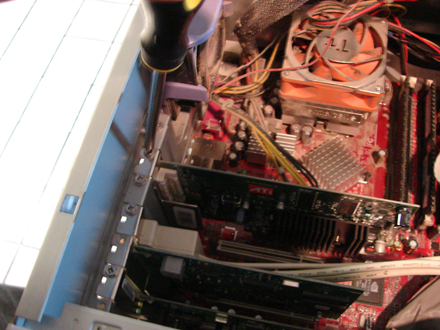 The first step will of course be to locate the PCI or PCI-E/AGP slots inside of your computer. You will need to figure out how your case opens as it varies from case to case, some have doors that swing open, and others you have to pull the whole metal shell off. Be careful when unscrewing your case not to unscrew anything holding the power supply in place as it is a possibility for it to fall down into your computer system. Make sure the power is unplugged from your computer. Once the case is off the PCI or PCI-E/AGP slots will be below the processor heatsink/fan, you will most likely already see what looks like cards sticking out of a couple of the slots. PCI slots are generally white/tan in color, but that can vary depending on your motherboard. 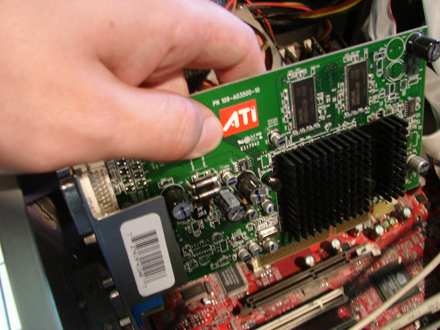 The PCI-E or AGP slot will be located above the PCI slots and are used for graphics cards. The following diagram will show the difference in appearance. As you can see from the above picture there are already cards installed in this computer. 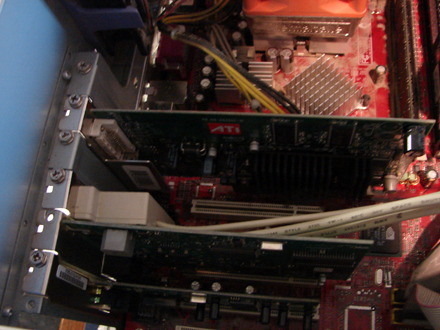 One AGP card up top, and a couple PCI ones below that. 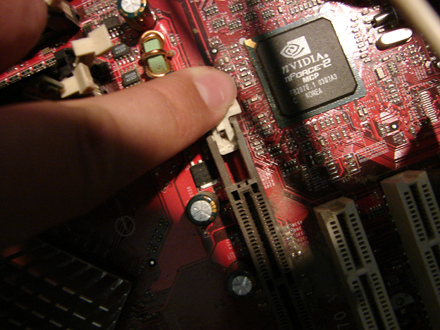 One general difference between installing an AGP graphic card and a regular PCI one is that there is lever that you must push down that is similar to what is used when installing RAM, if you are taking a card out you must remember to flip this down. PCI cards do not include levers and are simply pushed into place and screwed in. PCI-E cards also have a locking mechanism which you usually must pull horizontally. You will be able to see this when you are installing a card. A lever is illustrated below. Installing a PCI card is fairly straight forward, find a white slot, unscrew the metal plate that blocks it from sticking out the back of the computer and push it into place. As you can see below I am about to insert the card into the board, sometimes you must push firmly to get the card to seat correctly, as long as the metal pins on the bottom line up with the slot you are trying to install the card in you really shouldn't have many problems. Once you have shoved the card into place you can place a screw back where you took the metal plate out and your card is now installed. Always be sure to read the instruction manual before attempting to install a card, many systems require you to run software included with the card before installing it. Failure to do so can often lead to driver conflicts. *The Computer Cure is not responsibile for any damages that occur during self installation of hardware, we will however be happy to fix your issue if you happen to run into any problems.